Call came in from the police for an 80 yr old male walker who had sustained an injury to his leg descending Scafell Pike. His location was given as Broad Crag Col. but he was located on the col between Broad Crag and Ill Crag. He was with an organised group. 15 Wasdale MRT members attended and he was stretchered to the top of Grains Gill where members of the Keswick MRT came up to the top of Grains Gill to take over from Wasdale and carry him back down to Seathwaite.A donation has been gratefully received to be shared between Keswick MRT and Wasdale MRT – Thank you to the casualty for the donations and his kind words. Incident started at 18:37. 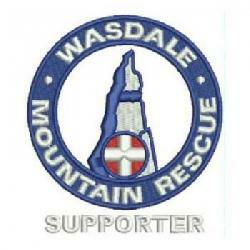 There were 15 Wasdale team members involved and the incident occured at NY 22077 07572 (880m).